Although multiplayer servers are no longer working since the termination of GameSpy servers in 2014, multiplayer is still possible by using GameRanger. 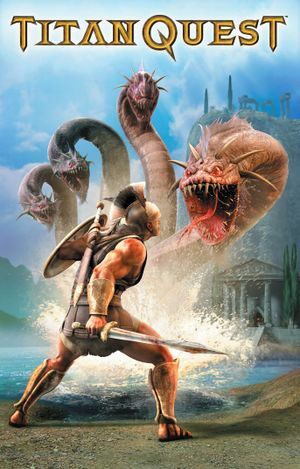 Titan Quest Anniversary Edition has a working multiplayer and is free to anyone registers a Steam copy of Titan Quest. Immortal Throne is the only expansion for the game. It brings many seamless enhancements to the original campaign and works as an add-on. It requires the original Titan Quest to be installed. Immortal Throne is required for most patches and mods. A bundle of Titan Quest and Immortal Throne is the most desirable version for newcomers (Oftentimes called Titan Quest Gold). Original version characters can be also imported into Immortal Throne, but the best option is to start a new game within Immortal Throne. The German version offered by Steam is a low violence version and only available in German by default. English language support can be patched in, the game itself will stay low violence, though. Already included with some mods, strongly advised. It fixes many bugs and technical issues left in the game. Immortal Throne expansion is mandatory. Save the 1.17a file in the installation folder. 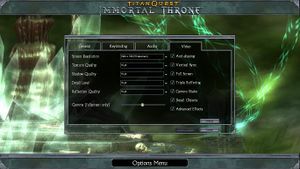 Run Titan Quest Immortal Throne from the Steam client. The title screen should read v.1.17sd in the bottom right corner. Do not save the patch in the original Titan Quest folder. As noted above, the German version is a low violence version with German texts and dialog only. 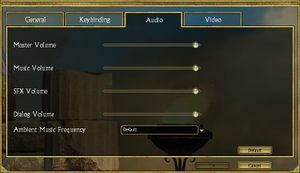 To enable English language support you have to download the language pack and replace a number of files in the installation folder of Titan Quest. The full instructions (in German) and the language pack can be found here. A versatile program with built-in mods, intro skip capabilities and a character editor (either to fix/restore broken characters or to cheat). Download game.dll and extract it. Replace game.dll inside <path-to-game> with the downloaded one. Acts as an external, independent, shared inventory. You can create unlimited Vaults, each holding whichever items you put in them. Useful for creating collections of rare items or "twinking" (giving characters items found by other characters, generally from later parts of the game and higher quality). It also has some item-editing features, such as the ability to change a relic's completion bonus, clone items or complete sets. User's of the Steam version of Titan Quest cannot use this tool. Use will likely result in corruption of all characters edited by the program. Extensive mod that raises the level cap to 85 (from 75) and introduces new content as well as balance, making the game more difficult overall but close to its original style. 1.17a patch is embedded. Underlord Primer provides a useful gameplay guide to Underlord for newcomers. Use Titan Quest Anniversary Edition to sync save data. Check if Install Location exists. Modify the value to contain the full path of the original Titan Quest folder. 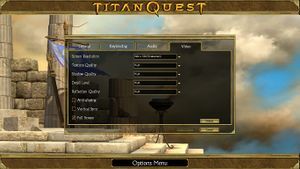 Upon reaching the main menu you will be told that Titan Quest needs to be updated. Choice of OK and Cancel will simply close the install process. Caused by version mismatch between Steam and non-Steam versions of Titan Quest. Titan Quest - Immortal Throne should now be installable. HUD does not scale up, and becomes very small. This can be made to work using ShiftWindow. Works with Borderless Gaming, but Titan Quest interferes with Win+F6 hotkey. To use with German version see Englisches Sprachpaket. German language only available in Germany. GameSpy features do not work. The Steam version has a beta update that resolves this. Players with the fanpatch installed can connect only with others that also have it. There may be an error with searching and joining multiplayer games online through Steam. The error message indicated a problem with .\common\gsPlatformSocket.c with Expression theSocket != INVALID_SOCKET. Open <path-to-game>\Engine.dll with a hex editor such as HxD. Change offset 0x164A0F to 0x11 (from 0x01) and offset 0x164A11 to 0x02 (from 0x03). Search for language = and change it to language = English. Open defaults.txt (in the same folder). GameSpy GameSpy features do not work. The Steam version has a beta update that resolves this. ↑ 1.0 1.1 File/folder structure within this directory reflects the path(s) listed for Windows and/or Steam game data (use Wine regedit to access Windows registry paths). Games with Steam Cloud support may store data in ~/.steam/steam/userdata/<user-id>/4540/ in addition to or instead of this directory. The app ID (4540) may differ in some cases. Treat backslashes as forward slashes. See the glossary page for details. This page was last edited on 14 April 2019, at 11:22.